In a quest for spiritual discovery and greater meaning in his life, journalist and filmmaker David Thomas stumbled upon channeling, a practice dating back to antiquity wherein an individual, usually in a trance state, makes a psychic connection with a spirit being. 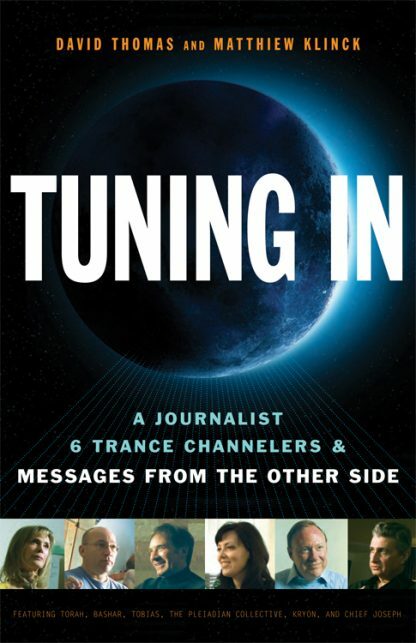 He was so taken with his first encounter that he arranged for in-depth interviews with six of the most prominent trance channelers practicing today and made a documentary about them, the critically acclaimed film Tuning In. In the book Tuning In, Thomas takes us behind the scenes as he and his cameraman Matthiew Klinck travel across the country, sharing their adventures and experiences meeting and interviewing these six remarkable men and women. We not only get to know both the filmmakers and the channelers as people but also to watch as Thomas transforms from skeptical journalist to true believer. Written in an engaging and accessible style, Tuning In shows how this channeled material answers many of life�s most basic yet elusive questions in profound ways: Why are we here? And, how can we create fulfilling lives for ourselves? This is a book about real people, real lives, with real advice for us all. Tuning In features Lee Carroll (Kryon), Darryl Anka (Bashar), Geoffrey Hoppe (Tobias), Wendy Kennedy (a Pleidian Collective), John Cali (Chief Joseph), and Shawn Randall (Torah). David Thomas is a journalist and filmmaker. He is currently at work on a sequel to Tuning In. A native Minnesotan, he now lives in Santa Barbara. Matthiew Klinck was raised in the small town of Aylmer, Quebec. His filmmaking began in his teens with a documentary about his grandfather�s charity. A strong believer in globalism, he travels as much as possible, and presently lives in Nha Trang, Vietnam.